Coming up we’ll hear from Frank Holmes, CEO and Chief Investment Officer at U.S. Global Investors. 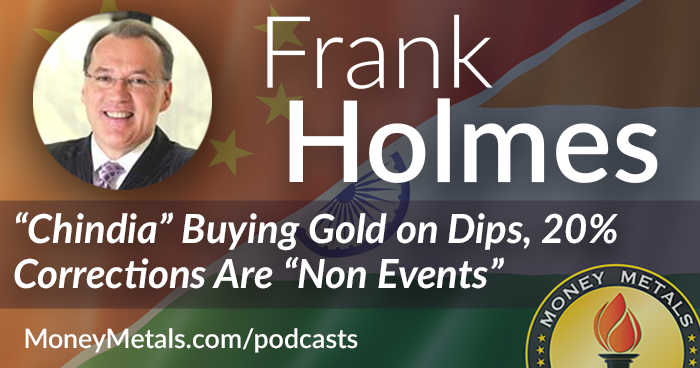 Frank talks about a seasonal norm he sees playing out in the gold market over the next few months, touches on what affect the election might have on the financial markets and provides some very interesting data on the gold demand coming out India. Don’t miss another fascinating interview with Frank Holmes, coming up after this week’s market update. Gold and silver markets moved higher ahead of Wednesday night’s presidential debate, led by gold mining stocks. The GDX Gold Miners surged 8% by mid week. However, the platinum group metals aren’t yet confirming a broader rally in the sector in a convincing way. As of this Friday recording, platinum prices come in at $936 an ounce, down 0.3% on the week. Palladium is off 3.2% to trade at $628. It’s hard to know what to make of the weakness in the platinum and palladium markets. Platinum has been on a steady decline since the beginning of August. In the past it has sometimes served as a leading indicator not just for precious metals, but for the economy and stock market. However, since platinum is such a small and specialized market – with the bulk of demand coming from the auto industry – it is susceptible to being pushed and pulled by forces that don’t necessarily apply to gold and silver. Platinum and palladium are primarily used in industry and have virtually no history as monetary metals. Gold and silver have been used as money for thousands of years and continue to play that role. Gold and silver markets are clinging on to gains this week although neither one has moved much one way or the other for most of the last two weeks now. Gold prices check in at $1,267 per ounce to register a 1.1% advance since last Friday’s close. Silver is managing a small 0.3% weekly gain to bring spot prices to $17.55. In recent days, the government delivered bad news to seniors who receive Social Security benefits. They will get a cost of living adjustment of just 0.3% in 2017. Needless to say, the token increase won’t match rising costs of living for millions of pensioners. The government's own figures show price inflation running at 1.5%. And according to the Bureau of Labor Statistics, rents are rising at an annual rate of 3.4%. Costs for medical care services are going up at a rate of 4.8%. The latter cost category often hits seniors especially hard. Meanwhile, health insurance premiums are surging at double digit rates as Obamacare looks more like it’s going to become Obamawreck under the next president’s watch. Hillary Clinton tried her best to defend President Obama’s record in the final presidential debate. No easy task. His signature healthcare law, which Congress infamously didn’t read before passing, is working out so badly that even Bill Clinton called it “the craziest thing in the world” in an unscripted moment on the campaign trail. The people that are out there busting it, sometimes 60 hours a week, wind up with their premiums doubled and their coverage cut in half. It's a craziest thing in the world. But perhaps the most expensive legacy that president Obama will leave is a near doubling of the national debt to some $20 trillion. In fairness, Obama’s Republican predecessor George W. Bush exhibited no fiscal restraint either. Under Bush’s watch federal spending grew at a faster clip than it did under Bill Clinton’s. The point is that deficit spending has become a bipartisan habit that nobody in either party wants to shake. The massive and growing national debt looming over us and future generations went virtually unacknowledged in the first two presidential debates. Kudos to debate moderator Chris Wallace of Fox News for finally calling out both Donald Trump and Hillary Clinton on their plans to saddle America with even more debt. We need to move on to our final segment and that is the national debt, which has not been discussed until tonight. Our national debt as a share of the economy, our GDP, is now 77%. That's the highest since just after World War II. But the non-partisan Committee for a Responsible Federal Budget says, Secretary Clinton, under your plan, debt would rise to 86% of GDP over the next ten years. Mr. Trump, under your plan, they say it would rise to 105% of GDP over the next ten years. The question is- Why are both of you ignoring this problem? Of course, neither Trump nor Clinton had a good answer. Trump would cut taxes without cutting spending and hope that a booming economy leads to growing tax revenues. Clinton imagines that she can raise revenues by taxing the rich more. She may find out the tax base actually shrinks as the wealthy pull back on domestic capital investment. But if she does become president, Hillary Clinton can count on her friends on the Federal Reserve Board to buy government debt in unlimited quantities. In theory, there’s no deficit too big for the Fed to paper over. The question is, at what point will the spending, borrowing, and printing cycle spiral out of control and trigger a currency crisis. We could find out the answer to that question some time during the next president’s term in office. There is no better protection from a dollar crisis than physical precious metals. Regardless of what happens in November, gold and silver are likely to come in handy for investors in the years ahead. It is my privilege now to be joined by Frank Holmes, CEO and Chief Investment Officer at U.S. Global Investor. Just a few weeks ago Mr. Holmes received another award from The Mining Journal and was named America's best fund manager for 2016, one of many awards he's received now in the mining industries for his fantastic track record. He is also the co-author of the book The Goldwatcher: Demystifying Gold Investing and is a regular guest on CNBC, Bloomberg, FOX Business and the Money Metals podcast. Frank, it's good to have you back on. Congratulations on another well-deserved award and thanks for joining us again today. Well, thank you for that recognition, but I want to make sure that your listeners know that portfolio manager Ralph Aldis is also key in that whole thought process and director of research and oversees the gold funds with myself. He's a geologist. He has a master’s in mineral economics, a master’s in geology. I like to tease him he has more degrees than a thermometer. Well, congratulations to you both, for sure. Well, on that note we'll start out here with the mining stocks because they've had a quite tumultuous year, Frank. Just looking at the GDX, one of the main mining stock indices here, it nearly tripled over the first 6 months of the year but then gave back about half of those gains. We may have found support recently at roughly 21 or 22 on the GDX. So do you think the downside move has exhausted itself in the miners and that we have seen the low here or is there more downside to come? I think that we have the worst behind us unless rates do have a big surge. But I’d like to point out that a couple weeks ago on our Frank Talk, an investor alert which we publish every Friday on our thoughts and observations of capital markets, and in particular on the gold. We published it October the 10th was gold historical 30 year pattern. And when you do get this massive surge in September and a fall in October, and it is just done like clockwork. It happens 80% of the time. Gold corrects from a big run in September. So, this is normal. Yeah. We saw a pretty good correction in the metals themselves a couple of weeks ago. Coincidentally, that coincided with the Chinese being on holiday. So, we didn't have the normal demand coming from the East during that recent price smash. Now as we are talking here we have got gold sitting about the 200-day moving average. It hasn't recovered too much in the days since that big pullback. I was reading in that Frank Talk piece that you were just eluding to about the October seasonal weakness, but we often get that rally later on in the year that usually follows that October slow period. So, what are you looking for there? Just talk about some of the recent price action in the metals. Well I think that we are probably going to run going into year end. Just recognizing that the world still is negative interest rates. Today the CPI number came out in the U.S., and if you look at two year bond yields. We are negative interest rates. The reason why I bring this up to your listeners is that the two year bond is sort of like a sporting event that all the countries’ currencies post up against. So, what is Canada's two year versus the U.S.? What is the Euro? What is the Australian? What is the South African? Money flows around on the difference of who offers the high real interest rates. For your listeners, real interest rates is, "What will the government pay you take away the CPI number." So if the government is going to pay you 50 basis points (or 0.5%), and CPI is running at 1.1% then you are losing money for the next two years. So anytime that happens you want to be long goaled in that country's currency. Fortunately today, these numbers came out in the U.S. and it reflects that people should have this exposure to gold. Expanding on the point here. What do you think is going on with the Fed here? Do you think that they are actually going to raise rates right after the election? Do we maybe get real interest rates back into positive territory again? The last time they did a rate hike, last December, it essentially marked the bottom in gold and silver prices. What do you see with the Fed and with real interest rates moving forward, because as you have always said, "Gold is fueled by the negative real interest rate environment." Well, I think right now they would have to raise them 50 basis points to get the two year positive. But it’s not just the U.S. dollar. That would make the dollar surge, and the price of gold have a big correction. It could easily fall. So it is a non-event for gold to go plus or minus 20% over any rolling 12 month period. Repeat that. It is a non-event for gold to go plus or minus 20% over any 12 month rolling period. That’s what happens 70% of the time. So you could easily have a $200 correction which would be just massive destruction, etc., but that would just be in line of markets and that would trigger by a surge of 50 basis points and a raise in rates. But I don't see that. I see that the governments around the world, the G20 countries, use to meet to talk about global trade. Now, since 2008, it’s a synchronized taxation and global regulation. What is that doing? It’s usurping away any economic benefits of cheap money. And the only big inflation shows up in stock prices. Especially dividend paying stocks. What you’re seeing is these governments are massively printing money, and you are allowed in other countries but not in America where the Fed can turn around and start buying the big blue chip stocks in Switzerland, in Japan, in South Korea. They own over 10% of their stock market and they are buying dividend paying stocks, because they have got negative rates. Here they can turn around and get a positive return. It sounds like we both agree that the central banks are intervening in these markets – all markets for that matter. Is there any reason that they can't just continue to prop up these markets until the cows come home, and they can continue to buy these blue chip stocks or all stocks for that matter, and really support prices? What do you think about that? I think they can do this for another four years. The big issue is what happens in the regulations. The only way to get real growth is to have streamlining of regulations and also make it easier for the formation of capital. You see in Europe, the EU, and part of the whole Brexit move, and we wrote about why Brexit would take place, because the Brits finally got fed up with all the rule making by un-elected officials. Just like 1776, taxation without representation leads to a revolution. And taxation and regulations without representation by the Brits lead to, "We want to be out of this game." And I think that it is important to recognize that the strangulation by regulation in the EU, but you are seeing it in America. They are attacking with a real strategy all the great technology companies. Netflix, if it doesn't have 60% or 80% content of French actors and actresses and filmed in France. They can't show films there. They have gone after Apple, which is the most high profile. They are going after Youtube, Google. So why don't they create their own Silicon Valley to create prosperity and opportunity for people? No, they’d rather have protectionism, and to tax away any upside. So I think that this thought process hasn't changed yet, and when it does then rates will rise and we’ll get greater global GDP. Switching gears here a little bit. I want to ask you about another one of your pieces there on Frank Talk where you covered Indian gold jewelry sales, and how they hit a four year high recently. What drove all that buying Frank? And I want to get your thoughts on all that demand from India potentially serving as significant support for gold and maybe a reason that it won't go much lower. Because they do like to load up on the dips, don't they? Talk about this. Well, I think it is important for your listeners to recognize that there are two demand drivers for gold. One is the fear trade which we just talked about, negative real interest rates, that whenever a country has negative real interest rates gold will rise in that country's currency. Money supply is another factor in the fear trade. When it comes to the love trade… it’s a cultural affinity towards gold for your family, for your loved ones. And in the event there is a crisis in that country or your family has dire straights, that you always have 24 karat gold jewelry which can be used to resolve problems. Gold jewelry in Asia, effectively known as Chindia (China - India equivalent) are 40% of the world's population, and throw in the Indonesia, and Thailand and Vietnam and that other sort of expanded region in that area. We’ve got 50% of the world's population that give gold. Whenever you have had strong pickup in the love trade, and the fear trade that is when gold hit $1,900. Go back to 2011, the 10-year government bond was minus 300 basis points, and the GDP per capita in China and India was rising dramatically. So, there’s this massive surge in gold demand. One of the things we have commented on is that there is a very strong correlation with GDP per capita rising and gold consumption rising for the love trade in Chindia and the surrounding area. Bloomberg in fact has a function that shows that. And what was profound last year was that China surpassed the U.S. on GDP per capita. Overall, GDP was way behind us as a nation, but on a per person it is significant because now you have 109 million middle class people and they are changing tourism. Tourism benefits greatly from Chinese tourists. You see them all over America. You see Chinese signs in all the outlet malls. You see them in the Grand Canyon, but you never saw it 10 years ago. So not only is it good for tourism and travel, they buy more gold. So, if I have a bigger income rather than buying you one gram of gold for your birthday. I’m going to buy three grams of gold. So I think this idea of the love trade is so important in understanding Indian households. What really shocks people is that they have the world's largest private gold holdings with 23,000 tons, and we try to highlight to investors that the Indian wives own more gold than is in Fort Knox. And they’ve found from corrupt governments, the devaluation of their currency over centuries, and particularly for living in the past 5 decades that gold has been a great way to protect your family. Yeah. Rising middle class over there in that region. Certainly you got to think that more and more gold buying is going to take place as a result. That’s very interesting information, and could be a floor of support for gold for sure. I want to talk to you about this idea of gold remonitization, because this is one of the data points many use when talking about a future gold price of $10,000 or double that. Give us your thoughts on this Frank. Well, governments can move the goal posts. And we saw this what happened in Cyprus where they froze all your accounts. Then, they took 10% heir cut of all your checking and savings accounts to pay for their mistakes and problems. And then they would only give you back 50 euros a day. Then it was 100 euros, and then it was 200 euros. Then 300 euros. So that thought process is the concern that that’s what’s going to happen with all paper money. And there’s also another big push to get rid of big currencies. Anytime they want to be negative towards these progressive, socialist economists is to demonize money. And no doubt regulations are out to stop all this. So they’re the saviors. The enemy of the people in the capital markets, and they want to be the heroes. So to have a conflict you need to have someone who is a victim, and someone who is a hero. And so they come along and play this role. And with that they say that gold is bad because only drug lords and Al Qaeda use gold. And then they’ll say with only big dollar bills it’s only drug lords and mafia. So, therefore we have to get rid of big dollar bills. Eventually they get rid of all paper money, and then they control your credit cards. They can control how you spend. Chavez did this years ago before he died in Venezuela that if you are a Venezuelan coming to Florida that your credit card couldn't buy Gap clothes or Saks. It could buy only certain dollar amounts for food and for hotel. Do you think we might get to a point where government has to back the currency with gold, and if that were to take place do we see gold just absolutely skyrocket, because the amount of dollars or whatever paper currency exists today you would have to have a significant higher gold price. Is that fair to say? Yes. But I think you would have to have a change in education system. You’d have to more schools teaching about Hayek and Von Mises’ economic model as a balance to Keynesian model. Keynes’ model is a big proponent of government playing an intricate role in economic activity. And the socialists thinking they prefer Keynes where Hayek and Louis von Mises, their whole thought process was "limited government." The best metaphor is a football field. If you have more referees than you have players no one is going to score. You want to have a limited number of referees that are calling a fair game, but you want to make sure the game gets played. And so what you’re seeing now is there seem so many regulations, and so many compliance people in so many parts of the economy. It just leads to a slower growth, and that’s what would happen at a sporting event. It would be a lower scoring game. Yeah. Certainly the Austrians have a long way to go before overtaking the Keynesians who seem to completely rule the day when it comes to central banking and central planning. Well, as we begin to close here Frank, what do you expect over the final couple of months of the year? What effect might the election have on the financial world? Does the outcome even matter in terms of the gold and silver market? Then also touch on anything else that you want to hit on that we didn't cover. Well, I have always advocated 10% in bullion. What a beautiful gold jewelry with low markup, and 5% into quality gold stocks. I‘ve written a lot about this and what has been driving these gold stocks has been a new breed of investors. They are quants. That helped win the award of being the number one gold fund in the world is having models for picking the stocks. Models for managing currencies and cash. And so with that we did an article saying, that if you looked at the lowest G&A, the lowest expenses of a corporation relative to its revenue and you pick out of 60 gold producers with market caps at greater than 200 million… you just pick the best 10 stocks last January. Those stocks jumped 88% in the first quarter versus the index of 45. And there’s changes each quarter, but those best 10 year to date are up 200% versus the index which is up 70%. I think it is important to recognize who is buying them, why, and this concept of looking for ratios that relate to high profitability or higher profitability is where money goes to. Franco-Nevada, Silver Wheaton, Royal Gold I’ve always recommended as a basket these royalty companies have a superior business models, which generates higher cash-flow returns than capital with tremendous optionality, because of a basic structure of how they do a gold loan. Any comments on the election and what it might mean for the financial markets here over the next month or so? Oh, I think that there’s just lots of noise. Certain industries will do well and others will be taking it on the chin. Both of them are big supporters of infrastructure spending. So, I think that’s something to take a look at, and I think the military machinery which is part of the industrials will continue to be strong stocks. And the government is at no will to change their fiscal policies from regulations and rules on steroids. So, we are going to live with lower interest rates, and this is good for gold. Well, terrific insights as usual Frank. It was great to talk to you again. Congratulations, once again, on that recent award. Very well deserved. Before we let you go. Please tell our listeners a little bit more about your firm, and your services and also how they can follow your fantastic Frank Talk blog. Well, thank you for your compliments. We are based in San Antonio, Texas. We are a no-load fund group. And we publish every week a swat analysis of capital markets from different industries, and the swat is always three sentences… three strengths, and three weaknesses of what the impact in the category last week; and what do we perceive as an economic data point that could impact capital markets next week. What could be an opportunity or a threat. Last week I commented that CPI will be the touchdown pass this week, and it clearly has been an important factor to getting a rally in the gold prices as the CPI numbers reflect the state of interest rates. So, I think that that is the best way. You go to USfunds.com and you look to subscribe to the investor alert, and Frank Talk. We have about 40,000 readers in 180 countries that follow our sort of system of organizing our thoughts and how we manage money. Well, it is fantastic stuff. Thanks again to Frank Holmes, CEO of U.S. Global Investors. The site is USfunds.com. Be sure to check that out, and the previously mentioned Frank Talk Blog. Some of the best market commentary you will find anywhere on gold, the miners, the commodities as a whole and other related topics in the investment world. Again you will find all of that at USfunds.com. Frank, thanks so much once again for visiting with us and have a great weekend. Thank you, and same with you. And happy investing. Well that will do it for this week. Check back next Friday for our next Weekly Market Wrap Podcast. Until then, this has been Mike Gleason with Money Metals Exchange, thanks for listening and have a great weekend everybody.